Beau’s flagship offering is Lug Tread Lagered Ale, named after the tire treads of a small tractor, a true symbol of Eastern Ontario. Golden-hued, crisp and finely balanced, Lug Tread is a tribute to “Kölsch” the classic beer of Cologne, Germany. 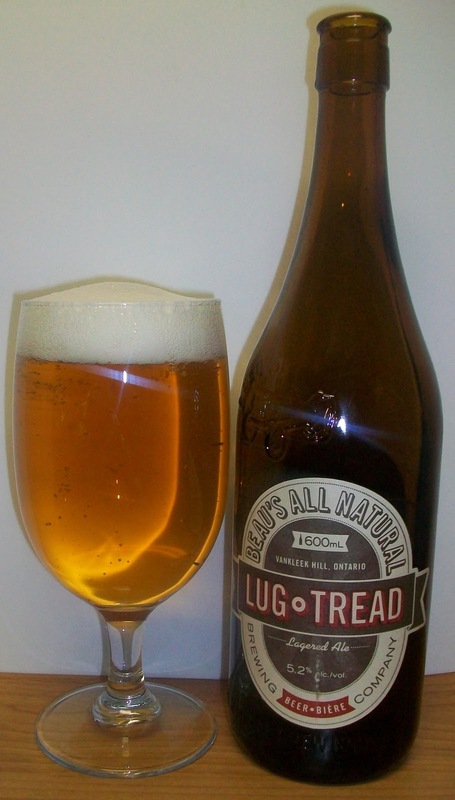 Lug Tread is top fermented (like an ale) and then cold aged, or “lagered”, for a lengthy period. This gives it some light ale notes, complemented by a lager-like crispness. This is another gift from my friend Gene. He was recently traveling in Canada and brought me back a couple of beers to review. I have never even heard of this before so I’m really looking forward to it. The beer pours a clear golden yellow color with a bright white head. The nose is nice with subtle but pleasant aromas a pilsner type malt along with an earthy floral hop aroma. This is a nice Kolsch, clean and crisp with that unique earthy hop flavor. This experience starts out with a light malt sweetness up font on the tongue. The middle of the sip is very refreshing with effervescence over the tongue. The back-end is very easy drinking. There is that unique Kolsch earthiness that starts to build toward the end of the swallow into the finish. The finish is nice with light malts and drying hops. There is also a slight bite on the finish but nothing bitter. There is slight aftertaste that is a hint of that unique Kolsch earthy note. This is a very good Kolsch. I am really enjoying this beer. I wish that I had a real Kolsch glass (Stange). This round bottom glass opens the beer up but I may be loosing some of the crispness of this beer by not drinking it in a Stange. As this beer warms those nice Kolsch flavors become more pronounced. I wish I know more about this beer and where that unique earthy flavor comes from. I don’t know if it’s from the style of malts or hops but it is good just the same. We are now at 62 degrees. There is a lingering malt sweetness now that I did not notice when this was colder. I’m going for a B+ on this one. This is a very enjoyable Kolsch, clean an crisp with that classic Kolsch earthiness.